Pouring rain limited our outdoors work yesterday to pretty much nothing. Got lots of editing done and organizing of the photos by subject matter. It was interesting to go over all the images to see how many homesteaders we photographed and how many barracks. Still need to work on getting the right light on a few scenes of barracks and Heart Mountain, maybe we’ll get better weather on Memorial Day. 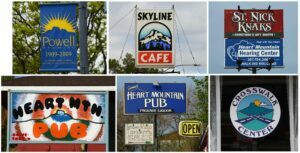 In the meantime, I had shot a series of signs that incorporated “Heart Mountain” or a graphic image of the mountain a few days ago. The peak is very distinctive and it sounds like Heart Mountain has been used to refer to this region for quite a while. The May 20 blog has the Powell Tribune logo. 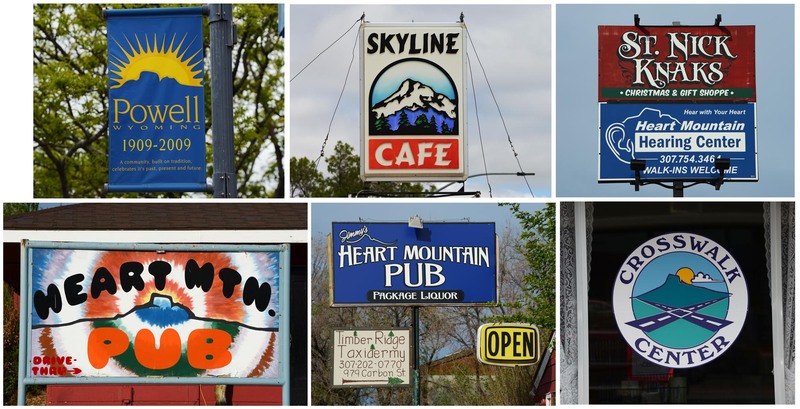 Three of the signs in today’s photo are from Powell, the blue community sign that lines the main streets, the Skyline Café and Crosswalk Center, a Christian library. In Ralston, a tiny town between Powell and Cody are the Heart Mountain Hearing Center (which shares space in a former barrack building with St. Nick Knaks). Just down the road is the Heart Mountain Pub, which had two great signs, one that calls it “Jimmy’s Heart Mountain Pub” (above a taxidermy sign) and the other a nicely psychedelic version with our mountain peak at the center.